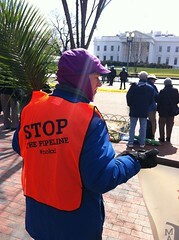 A week of protests against the Keystone XL Pipeline in Washington, DC continued Thursday with civil disobedience at the White House and visits to pipeline profiteers. Fifteen participants in the Interfaith Moral Action on Climate (IMAC) were arrested for blocking the sidewalk in front of the White House. Religious leaders called the Keystone XL Pipeline “a grave threat to humanity” and described their moral obligation to stand up against it. Protestors then stormed the lobby of energy company Valero Corporation, a major investor in the Keystone XL Pipeline. Valero stands to receive and refine more oil from the pipeline than any other company.